This past weekend was odd because I flew solo, away from my family. Each one of us went our separate ways. Husband went fishing. Oldest went on a mini-vacation with her best friend. Youngest was pumped to play BIG cousin with family. I kept myself busy by having dinner with college friends (sisters), catching up on laundry, dabbling in online shopping (I know, went against what I said on Friday), sleeping in and cleaning up an eerily quite house. It was nice and peaceful, but I was ready for the chaos to come home by Sunday afternoon. As I am typing, all is back to normal in my household and there isn't any better way to spend the evening. Having a little time apart every now and then is healthy in my book. As they say, distance makes the heart grow fonder. I actually missed hearing little voices shout, "Mooooooooom!!!" every ten minutes. I picked up these J.Crew Factory floral, tropical shorts on super sale (the sales ends tonight). Yes, the print was what got my attention, but their length sealed the deal when it came to making the final purchase. They are 5" in length which can be difficult to find...especially in cute, non-frumpy patterns. I also bought this print a few weeks ago in the same cut and style and wore them in this post. The quality it typical J.Crew, AMAZING, and the fit is true to size. HUGE NEWS: I was flipping through my People Style Watch magazine and came across a deal that I had to share. You ladies know how obsessed I am with Kendra Scott Rayne tassel necklaces. I own four and want more. They normally run $80 no matter where you purchase. Well, I found a 20% off code in my magazine. This will save you almost $20. So, if you have been on the fence about purchasing one, now is the time. Use the code rayne20 at checkout. They come in over twenty different colors. I seriously wear one at least four days a week. Cute shorts! And what a deal on those Rayne necklaces... I have one and it is so tempting to get a second. Glad you had a chance to enjoy some quiet time and recharge! I have been thanking about getting these shorts. They look great on you! I have been away from my boys for a week and I miss them dearly. Love these shorts, you look adorable. Thanks for the coupon. If you get the chance, please share your amazing post on my link-up today. I also saw that Kendra Scott coupon code in my Stylewatch mag. I am so excited about it! Definitely going to take advantage of that deal before it runs out. The hard part is deciding which color! That top is ADORABLE! And the shorts! Super cute shorts! Love the whole outfit! LLLLOOOOVVVVVEEEEE those floral shorts! Seriously. Love. Those shorts are so adorable!! And of course I'm loving the chambray too! Very cute. I love the shorts and your accessories are gorgeous. Those cobalt sandals are quite eye catching. Love everything! I'm loving the print of your pants! Everything, right down to the accessories is perfect about this post! I just love printed shorts! Look great on you:) I know what you mean about missing the "Mooooooooom"
I love your sleeveless chambray shirt! It's on my shopping wish list (along with a million other things, ha). I'm loving those sandals. I usually stick to neutrals since they match everything, but these are fun! Time apart makes you better able to appreciate the time you're together! Sweet deal on the necklaces. Adore your shorts! The pattern is beautiful! Ohhhhhh I've been wanting another KS necklace! Off to purchase now! OMG i have been dying over a kendra scott necklace!!! thank you for the promo code!! and second, sometimes flying solo is the best! Such a cute summery look! Love the denim top and floral shorts! It IS weird how having a little quiet around is becomes odd, right? I can be driven crazy by the noise and constant action of my little's, but take it away from me and I am lost. Glad you and some fun and a little time to recharge! Sounds like a busy but fun weekend! Glad you got to hang out with some friends and who doesn't love online shopping! Your shorts are fabulous, I adore the print and who could resist them for such a good price! Love this easy summer look! Sounds like you had a nice relaxing weekend! Those shorts are so adorable. Love the print! Hope you're enjoying your Monday! Cute necklace! And love those shorts. I have been drooling over that Kendra Scott necklace--man, now I have no excuse not to take the plunge :) Thanks for sharing! And you look lovely!! Love that necklace!! So cute. I am tempted to get one as well now! That is such a great deal on the Kendra Scott necklaces! I've always wanted one! And I agree that some time alone is healthy once in awhile! That's so sweet that you missed them! 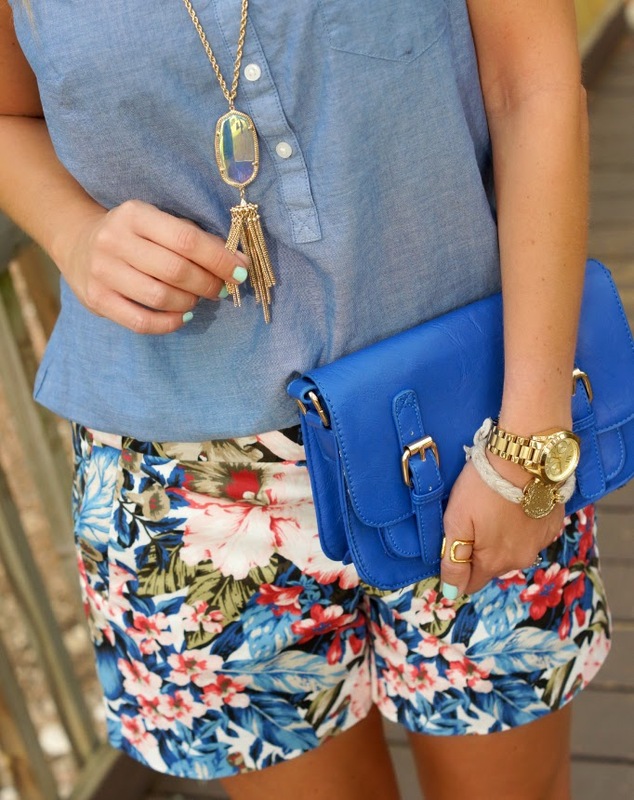 darling floral shorts and cute necklace! great look! Love your cute outfit!!! Your floral shorts are just perfect. Love that they are on sale as well!!! Thanks. These are on my list now. :) Hope you have a great week!! those shorts and sandals... perfect!!! I just picked up those shorts a few weeks ago and wore them in a post last week. You are right. The fit, length, and fabric quality are so good. My kids have been at my in-laws for a week and I miss the chaos. A few days alone is great, but I can't wait for them to come back this weekend. that's why i love crew...great quality!! i'm biased to the price because they always seem to have great sales...and my teacher's discount doesn't hurt either lol!! you look wonderful!! I love those bright blue shoes! I don't know if you're into Lilly, but Lilly Pulitzer makes shorts in a great 5in. length in so many fun prints and colors (the elephant one is adorable! ), and they're really reasonably priced too! I love this whole outfit. The color of those shoes is amazing! Sounds like you had a nice quiet weekend. Sometimes I really need those to recharge. Love this outfit! Those shorts are too cute! That sounds like the most perfect weekend! I can't even imagine what my house would feel like to have just me in it. Oh, all the stuff I could get done lol!! Love today's look!! I have been desperately trying to find a great sleeveless chambray top! Thanks for the options! Have a great week, love! Great outfit but then again all your outfits are great! Hope you enjoyed some alone time! Thank you! Someone that can rock the 5 inch shorts! I love it! Rock on! I'm glad you had a fun time away! :) Looking great! I'm loving the length of your shorts!! It's so hard to find shorts that aren't insanely short. Such a fun print too! I love this look! I am glad you had a good weekend to yourself. When my fiance travels during the week I usually enjoy the "me-time" for a day or two, but by the end I am more than ready for him to come home, haha! I love the length of those shorts, very appropriate for someone over 30...like me! Thanks forsharing the coupon code too! Very cute! I love the shoes and bag, and what a great deal on the necklaces!